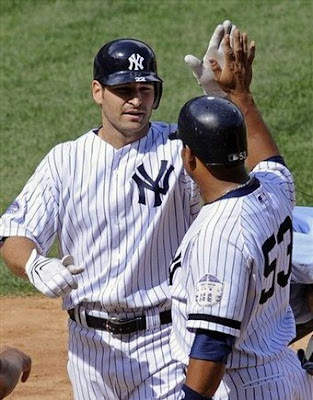 UPDATE: According to Peter Abraham of the LoHud Yankees Blog, Xavier Nady will not require surgery on his injured elbow. Unfortunately the return date for Nady is still unknown. Xavier Nady had Tommy John Surgery on his elbow in 2001 and he may need it again. He will be placed on the disabled list before Thursday's Home Opener. For the New York Yankees and obviously Xavier Nady, this is bad news. Fortunately, Nick Swisher is still around and hot to boot. He is the obvious replacement in right field which is good for his owners but a problem for the Yankees' depth. Melky Cabrera will obviously get to hang around a lot longer. The Yankees will need some corner infield depth which with third baseman Alex Rodriguez out and first baseman Mark Teixeira's wrist bothering him when he bats right-handed was already a problem. Shelly Duncan is probably the first option. This may force the Yankees to consider some trade options. Players such as Hank Blalock and Dallas McPherson could be available. In the short term, Nady owners in shallower leagues should check the waiver wire for Swisher, who with is hot start may already be out of reach. In deeper leagues, Melky Cabrera will see an increase in at-bats especially against left-handers. This could also force the Yankees to seriously consider A-Rod's claims that he could be ready by the end of April. Wow guess they were lucky they never dealt Swisher.